A Christian drama film set in 1950s small-town Georgia, BROTHER’S KEEPER deals with the trials and tribulations of two brothers, Andy and Pete, who may be identical twins but whose dispositions are less than similar; whereas Pete is a pacifist with strong faith in God and ambitions to become a preacher, Andy is more cynical, believes in revenge and has no plans for the future. When Pete is framed for a murder, Andy must come to terms with their differences in order to try and clear his name. The title of the film is a Cain and Abel reference, though it seems rather unlikely that this type of heartwarming Sunday School fodder would stick to the same ending. Providing the score is BILL BROWN, who has worked in video games since the late 90s and supplied music to nearly 200 episodes of the crime TV show CSI: NEW YORK – this is one of his first film credits, along with THE DEVIL’S TOMB in 2009, with MovieScore Media releasing both as part of their admirable mission to give exposure to lesser-known scores and composers. 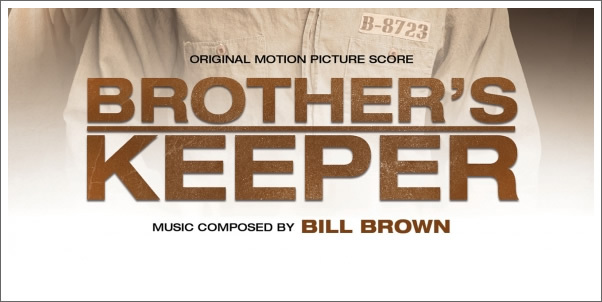 Practically any film score collector, upon spinning BROTHER’S KEEPER for the first time, will instantly know which composer was most heavily featured on the temp track: THOMAS NEWMAN. An obvious choice, considering that he has provided music for a number of Southern drama films stretching back to FRIED GREEN TOMATOES in 1992. Fortunately (or not – more on this later), there aren’t any direct quotations of melody or theme – rather, it’s the way the score’s moody atmosphere is created. “Georgia 1949” (1) opens the score with a vaguely exotic flute flourish and leads into melancholic, echoing piano figures (both recognizable NEWMAN techniques). The harmonic language is actually a cross between NEWMAN and some of JAMES NEWTON HOWARD’s more downbeat writing from UNBREAKABLE and BATMAN BEGINS, a rather enticing combination.